If you are looking to replace missing teeth with a set of dentures, the office of Dr. Dana Walters can help. First, we can determine what kind of dentures you need and then help make them fit, feel, and look as natural as possible. Dr. Walters can even help you make your old set of dentures feel more comfortable and look like your own set of permanent teeth. 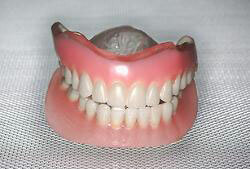 Even with dentures, oral health is important. Regular visits to the dentist are needed to make sure everything still fits and works as it should and that the rest of your mouth is in good health. Whether it’s maintenance or making a new set of teeth, Dr. Walters can help you and your dentures look and feel your best!